Offset printing, or offset lithography, is the standard commercial printing method used around the world. This has been true since the 20th century, and the method still produces most of the printed material used by businesses today. 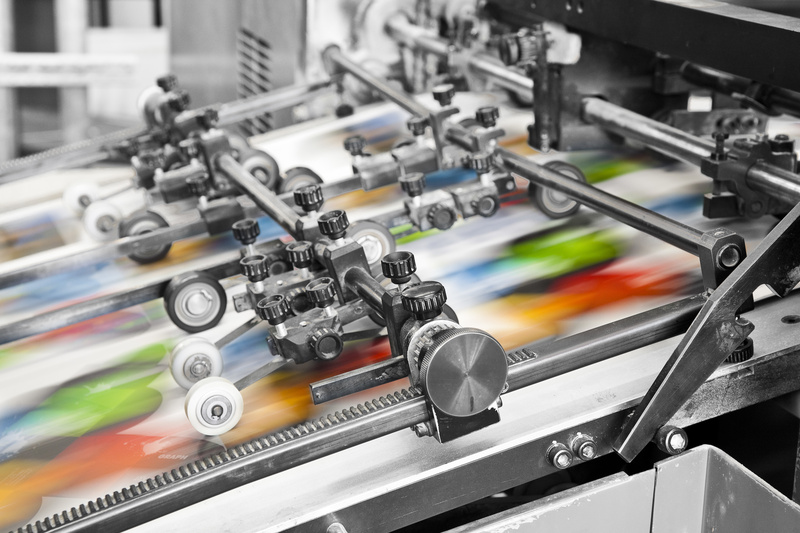 Offset printing’s modern competition is digital printing. This is also a valid method and is a great option for short run printing, which most people consider to be projects starting at one single copy and ending somewhere around the 2,000 copy mark. On the other hand, offset printing is still the way to go for higher volume jobs and can be very economical if you require thousands of identical copies. Really, value can be found in both digital printing and offset printing. The decision on which method to use should be based on the specifics of whatever project you are working on at that time. Here’s how the offset printing process works: the project’s layout of text and/or art is put on thin metal plates. The press then dampens these plates with water and ink. Because oil-based ink and water don’t mix, the ink adheres to the layout on the plates while the water adheres to the blank spaces. The inked area is then transferred to a rubber cylinder, which then transfers the layout onto the paper. This is actually why the method is called offset, because the image of the layout doesn’t go directly from the plates to the paper. Offset printing presses apply four basic ink colors (cyan, magenta, yellow, and black) one at a time. Each color has its own plate that deposits small dots in specific patterns that make our eyes believe we are seeing a wide range of colors instead of just the four inks. Offset printing has been known for high quality, color specific images for decades. While digital printing is catching up to this reputation, digital presses don’t have quite the same color control as offset presses because they use toner instead of ink. This is an important distinction for many companies who have colors that are specific to their branding and need to be replicated identically. These companies often use the Pantone color management system and offset printing for exact color precision. Fun fact: offset printers can also use pre-mixed metallic and fluorescent inks! Plus, these presses are great at creating very delicate gradients. The opportunities are endless! It should be noted that, because the process is rather extensive and intricate, setting up an offset press requires a skilled operator. Even an experienced operator, however, has to run a few test sheets, during which the press is running at a slow enough speed that they can make adjustments to ensure the final products will be perfect. After the press really gets going, however, it’s inconvenient to stop and change something. So, print projects with a lot of variable data are best served by digital printing. If you want to personalize collateral with each recipient's name, for example, you’ll no longer be saving money or time with an offset press. This is because each sheet being printed would require its own plate to be made. If all of your copies are identical, however, the offset printing process goes extremely fast once that initial setup is done. These days, there are even special coatings that can be used to make the ink dry quickly. One useful benefit of offset printing is that these full size presses usually run sheets that can go up to 40 inches in length. This helps print customers produce posters, large books, and other unique projects. There are also wide-format digital printers, but the main downside of these is that they can’t handle all substrates. Offset presses can print on anything from extra light stocks to extra heavy stocks! They can even print on fabrics like linen and felt! A lot of this has to do with the use of ink, which lays better on textured surfaces than toner does. Ink also works better with finishing options like foil stamping and embossing. Also, offset printing is the route you should take if you want to print light colors onto dark paper. Really, there are all kinds of unique circumstances that will point you toward one method or the other, but these are some of the most common examples. The main factor to consider when deciding if your project should be sent to an offset press or a digital one is how many identical copies you need made. Because the most expensive part of using a commercial offset printer is the setup, the more you print, the less you pay per piece.